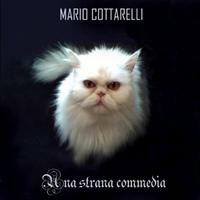 Mario Cottarelli’s latest disc finds him performing some classic Italian progressive rock. The vocals are often in the theatrical, dramatic style so common in the genre. The music is ever changing and often too hard to keep up with in its complexity. Still, it works exceptionally well throughout. Keyboards bring this in and then it works out to a bouncy sort of motif for the first vocals. The cut continues changing and altering from there, though. This is decidedly Italian progressive rock, not just because the lyrics are in that language but because it has trademarks of that style in the rather old time traditional vocals and styles it drops into at times. Those familiar with Italian progressive rock will recognize the trademarks, while they might throw off the more casual listener. This is a track that just continues changing, working through territory closer to things like Emerson Lake and Palmer at times while conveying purely Italian sounds at other points. It’s hard to keep up with all the rapid fire changes when writing about the song, but as a listening experience it will never bore you. There’s even a section that crunches for a short time. If there are references to more traditional progressive rock, Emerson Lake and Palmer is certainly the most valid connection. Around the five minute mark, though, we’re taken into a rather symphonic prog movement before dropping down to a short percussion dominated movement. Then keyboards take it out from there. Once more we’re off on a series of changing movements and sounds after that. This is definitely a less far reaching piece, but it still does quite a bit of progressing. The early sections are based heavily on keyboards driving it. The vocals are even more traditional Italian. There’s a hard driving symphonic movement later in the piece, though. Some of the synthesizer on this number really steals the show. Bouncy keys bring this in. Then we get vocals that are quite theatrical over the top. It powers out a bit as it continues, but this general motif holds the track. Layers are gradually added. This is the least dynamic cut to this point with the variations happening more in terms of various layers and flavors added rather than alterations of the musical structure. It rocks out pretty hard at times. Dramatic and powerful tones, led by the keyboards, drive this one in dramatic progressive rock directions. It drops back later to a mellower, rather electronic meets symphonic segment, but overall this is another that remains fairly constant, at least for a while. Later it’s reworking into what is the strongest movement on the whole set, this is a real powerhouse. It’s got vocals that are more mainstream and a musical structure that runs a wide gamut of progressive rock styles and progressions. At twelve and a half minutes in length, this is also the longest number here. It’s an instrumental that’s a real powerhouse. Keyboard solo like crazy over the top of this and some parts actually remind me of Yes, while other sections point to ELP and still others are less directly tied to any particular musical reference point.